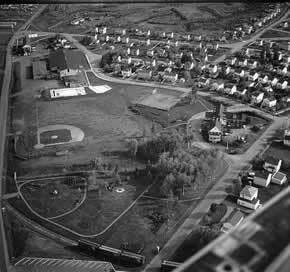 Probably the most impressive addition to the community in the 1950’s was the half million dollar Recreation Centre that officially opened in November 1957. Touted as the finest facility in Northwestern Ontario at that time, the Recreation Centre houses an arena, gymnasium, curling rink, bowling alleys and several meeting rooms all under one roof. Two years later, through the efforts of the citizens of Red Rock, an outdoor swimming pool was added to the complex. Much of the money raised for the swimming pool was through various fund-raising activities, including the “Buy a Bag of Cement” campaign. Once again, the community pulled together and through the efforts of volunteers, a brand new pool was officially opened on July 1, 1959. The 1960’s brought more positive changes in the community; more private homes were built and the population increased. One of the biggest changes was the merger of St. Lawrence Corporation with Dominion Tar And Chemical in 1961. The Red Rock Mill then became part of the newsprint and container board division of Domtar. 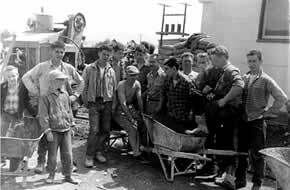 In 1965, 650 people were employed in the mill operation and the total payroll was $4 356 822. A major expansion program was undertaken to increase the tonnage of pulp produced by 150 tons per day. Renovations to both machines improved their performance. An increased concern in water and air quality forced pulp and paper companies to reevaluate the processes being used to make their products so at Domtar Red Rock $18 000 000 was spent on a pollution abatement program. In April 1962, the original Legion Hall was destroyed by a fire of unknown origin. Work was started immediately on a new structure and with much hard work and dedication a new building was completed in time to be dedicated on November 11th of that year. The Nipigon Red Rock District High School was expanded to 28 rooms and many new programs were added to the curriculum. During Centennial year a new post office at the corner of Salls Street and White Boulevard opened for business. The 1970’s were another decade of change for Red Rock and many interesting and progressive initiatives were undertaken. At the mill, new facilities for the handling of chips, sawdust and shavings were installed in anticipation of the time when wood would no longer arrive at the mill by water. In 1973, the era of the river drive ended. This meant there was no longer a need for the slasher-reclaimed and in April 1973, many residents watched as a landmark was demolished. Salls Street got a face lift during the 1970’s when the side walk in front of the businesses was replaced. In 1974 the new Red Rock Public School replaced the one built in 1947. A liquor store opened on the premises of the former Pool and Billiard Hall. Across the street, the new St. Hilary School welcomed pupils and teachers in September 1978. Then in 1979, a new Credit Union office was built next to the Post Office. At the waterfront, a new water treatment plant went into operation and a new Public Works Garage and office replaced the barn on the hill near the mill. The Fire Hall was relocated from the Municipal Office to the new Public Works building. Prior to the 1970’s, it seemed that very few people remained in Red Rock once they reached retirement age. Up until that time, people often returned to wherever they had lived before coming to Red Rock, in other words, Red Rock was not really considered to be home, it was a place you came to make your living and then you went back home. This has changed, and now many retirees stay in the community. 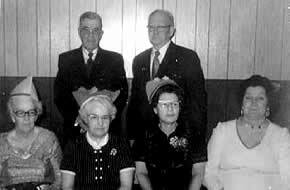 In order to meet the social needs of this group, a seniors’ club was formed in 1974. The Golden Age Club moved into the room at the Recreation Centre that was the Teen Room. Since it was initiated in the 70’s, the club has been very active, not only in providing a social centre for seniors, but also in providing assistance with various health, housing and transportation issues that affect an aging population. The 1980’s continued the growth that started in the 70’s and the town underwent more changes. Late in the 1970’s, the trustees of the Improvement District recognized the advantages for the citizens of Red Rock if the town incorporated as a township;this would give the people the right to choose a town council that would represent them and make decisions in the best interest of the town. Application was made to Ontario Municipal Board and approval was received in time for elections of a Reeve and Town Council in November, 1980. 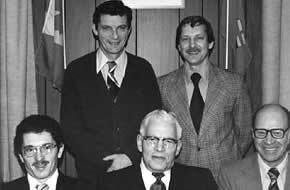 Members of the first Township Council were Reeve Douglas McAllen, and Councilors Dennis McNinch, Larry Dunville, Douglas Mowat and Bill LeMay. At the Mill, a major modernization project was undertaken when a computer control system was installed on the newsprint machine. Environmental concerns were also addressed in the 1980’s when a new recovery boiler came on line in 1984. The new recovery was meant to improve the quality of the finished product and at the same time significantly improve the air quality in the area. Very good news for the citizens of Red Rock; no more smelly smoke! Early in 1980, serviced lots became available on Taylor Avenue and several new homes were built. Once again, through the efforts of volunteers, a new Fish and Game Club replaced the one that had been built in 1948. Domtar Forest Products moved their operations to a new office building on Baker Road in 1986. In 1961, a two-storey expansion on the back of the Municipal Building was built to house the Red Rock Public Library, the basement used as a Day Care Centre for a short time. Seniors in Red Rock saw their efforts pay off in 1989 when the seniors apartment block, Mountainview Court, opened its doors. At the same time, all the new buildings were being built, a forty-year-old landmark was demolished and not replaced when the Canadian Pacific Railway Station was torn down in 1989.